The Esbit story began in 1936. Since then, Esbit stands for safe and highly efficient solid fuel cubes and stoves that have been used the world over. This compact solid fuel source will provide a steady and reliable heat for cooking, boiling water or for warmth in the outdoors. 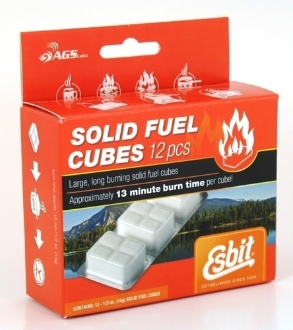 Esbit solid fuel cubes and stoves are used by various NATO forces, expeditions, in the aftermath of disasters and by a wide variety of outdoor enthusiasts. Approximately 12 minutes burn time per cube. Can be extinguished and relit, reusable. No visible smoke and no sparks. Makes a great campfire starter.